We’re excited to feature three unique projects that we completed for Huffington Post, Kia, and Visual News. Each project used a tightly structured narrative to tell a consistent and clear story. With either a lot of data or broad content being presented, our goal for all projects was to refine that information into a singular story. We hope you enjoy all three projects. Got a weekend to kill in Southern California? We’ve got just the plans for you. That’s the idea behind this interactive city exploration. In partnership with San Diego Tourism to raise travel awareness, Huffington Post reached out to us to create a highly visual, informative guide to activities available throughout town. 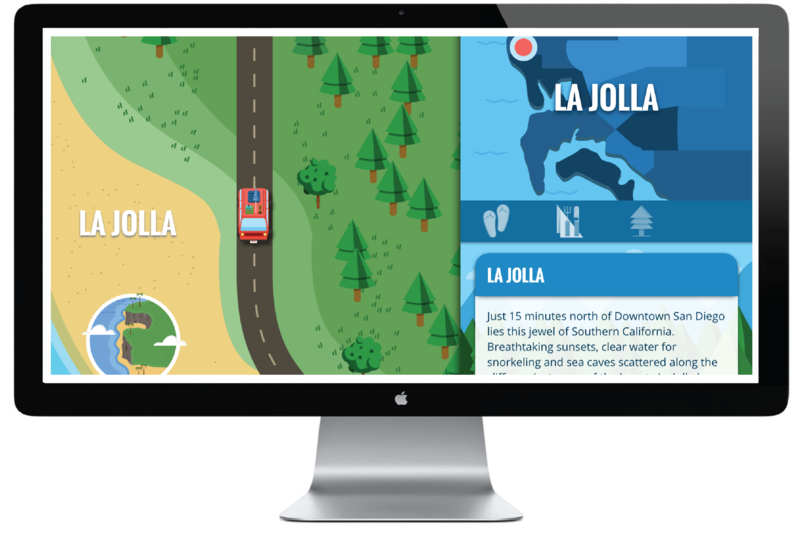 With so much to do in this great locale, the interactive focuses on some of the lesser-known destinations and unique neighborhoods that San Diego has to offer. We partnered with the team at Kia to create an editorial motion graphic on the evolution of the modern car. This motion graphic takes a look at key dates throughout the automobile’s history, highlighting the drastic advancements made over the last 100 years—all in under 2 minutes. Kia’s goal was to create a highly shareable visual piece to increase brand exposure and note the company’s forward-thinking position in its market. By now, we all know California’s in the midst of a record-breaking drought. But what does that actually mean for Californians and those living outside of the state? A whole lot, it turns out. We teamed up with our sister site, Visual News, to break down the overwhelming data into meaningful stats to help us all learn how we got here, understand the severity, and find ways to solve the problems it’s caused.